In a large baking pan, toss the squash with the olive oil, thyme, salt and pepper. Roast until very tender, about 35-45 minutes. Mash coarsely with a fork. Stir in the chopped spinach and mix well. In a large skillet, heat the olive oil of your choice and sauté the onion and red bell peppers until tender. Add the minced garlic and sauté for 2 minutes. Add the remaining marinara sauce, lower the heat and simmer 10 minutes. Spoon enough marinara sauce into a 13 x 9-inch casserole to thinly cover the bottom and set aside. 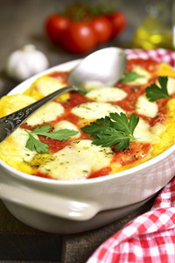 Arrange 18 polenta slices over the marinara and top evenly with all of the spinach butternut mixture. Spread half the heated marinara-onion-garlic mixture over the squash-spinach mixture and sprinkle 1/2 cup of mozzarella over the top. Layer the rest of the polenta on top of the cheese. Top the polenta with the rest of the marinara and sprinkle with cheese. Cover with foil and bake at 350 degrees for a half hour. Uncover and bake an additional 10 minutes until the mixture is bubbly.